Play South Africa's biggest mobile casino. Get R11,500 Welcome Bonus. Springbok Casino is also available for your mobile phone or tablet. You can currently enjoy a selection of your favorite games and we will be adding more on a frequent basis. 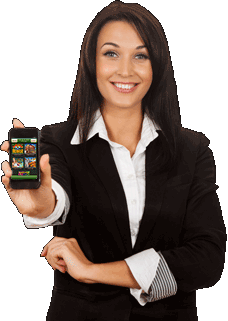 Springbok Mobile Casino works on iOS, Android, Blackberry and Windows devices. Since 2018 we also provide our Springbok Casino App for Android devices. We've made sure you don't get bored, no matter where you are. So long as you've got your iPhone, iPad, Android, Blackberry or Windows mobile device on you. You don't need to cramp up your phone's memory with any additional apps as all our games are available in Instant Play. Accessing numerous slots and a selection of Roulette, Blackjack and Poker games is easy and quick, and whatever your favourite casino game, you'll be able to play it online. You like our rich promotional library? No problem, you can claim any of the attractive offers when on the go as well. Want to invest cash and go for one of the lucrative progressive jackpots? Piece of cake! Use one of the secure payment options to deposit money and collect your winnings. Try it out and you might witness Springbok mobile casino quickly becoming your favourite travel companion. While you're travelling on a bus, train, boat, or any other means of transportation, which don't demand your continuous involvement, what better way to keep yourself entertained, than launching our mobile casino and enjoying one of your favourite online casino games? Whether you want to play just for fun or earn some cash while on the go, today it's as easy as pie. To think that just 10 years ago that was not the case! It all started in the late '90s and Nokia's pre-installed mobile game called Snake. Some years later, first the Wireless Application Protocol and then Java enabled us to connect to Internet and download games onto our phones. But the real breakthrough came with Apple's iPhone, with Texas Hold‘em being one of the first games offered through App Store back in 2008. Google Play quickly followed, and in 2010 we got HTML5 which allowed for the development of cross-platform games that could run on computers, phones and tablets. As technology developed and more and more online casino operators jumped on board, our mobile gaming experience got better and better. Today, mobile-optimised sites often match their bigger relatives in quality of design, user-friendly interface and all of the functionalities. While some casinos provide special apps to be downloaded from various app stores, others allow us to access mobile sites simply by entering casino's web address into the browser of our mobile devices. Just as we would via our desktops!